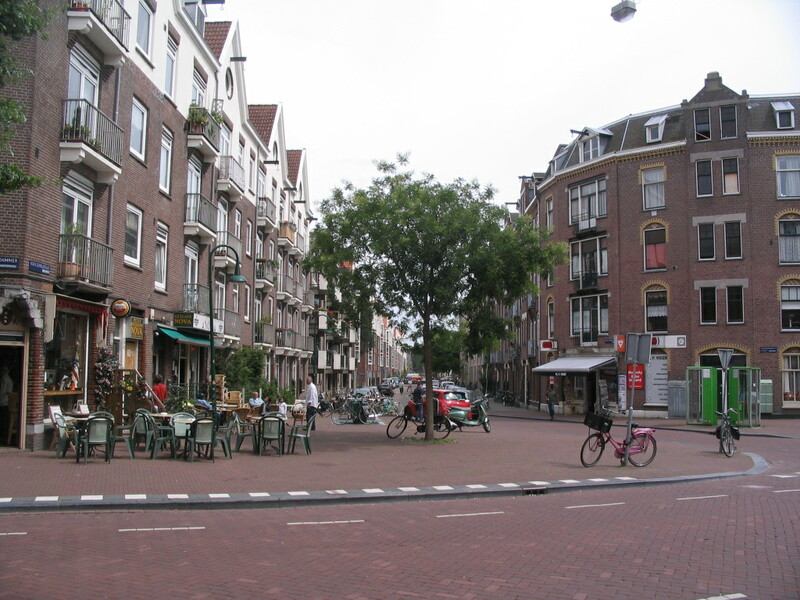 The next day we scampered hither and yon, all over the city. 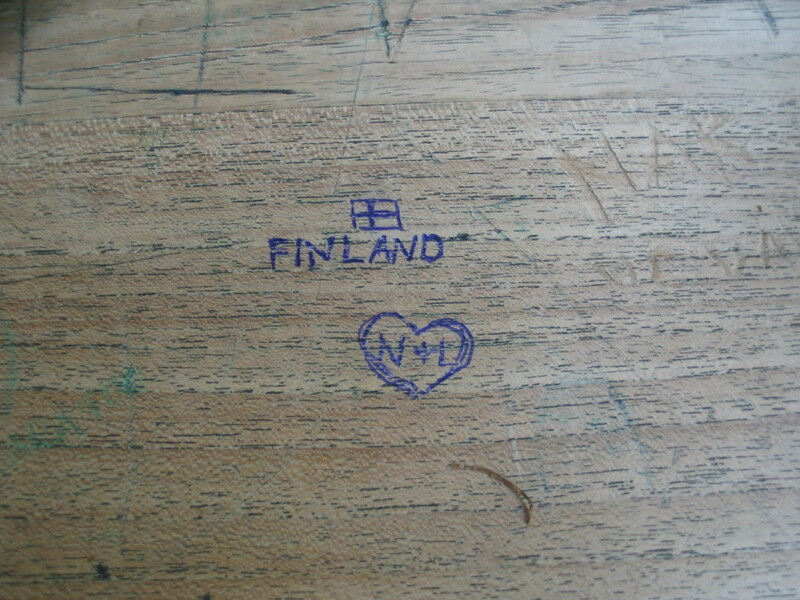 Carved into the dining table at breakfast: memories. 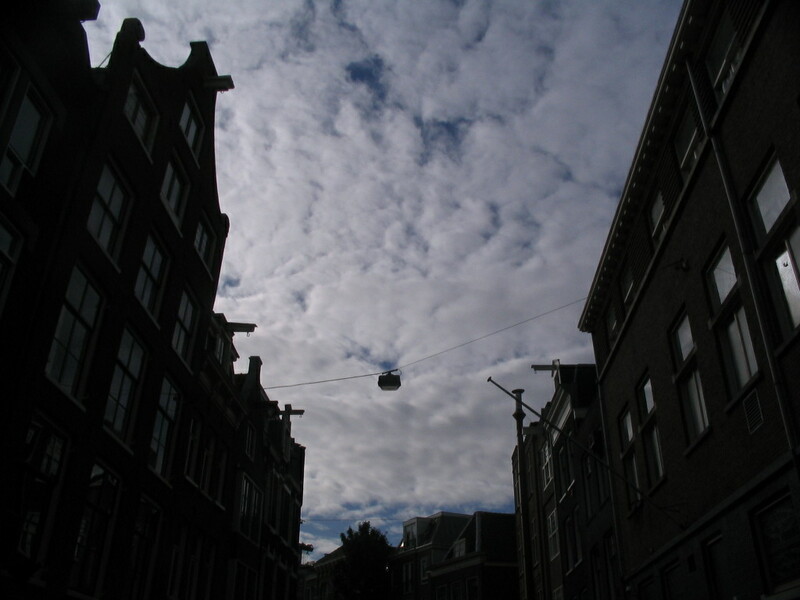 A pleasing sky shape, just outside the hostel, I think. The first destination of the day was the Van Gogh Museum, which was a treat. (My favorite part was actually the less-crowded exhibition on Odilon Redon.) 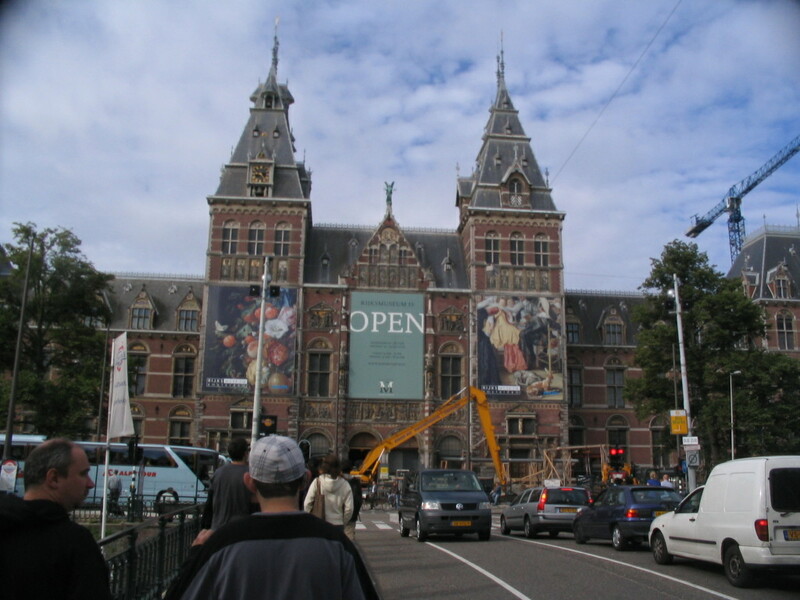 Nearby is the Rijkmuseum, which see here in all its glory — well, most of its glory; it was under renovation. 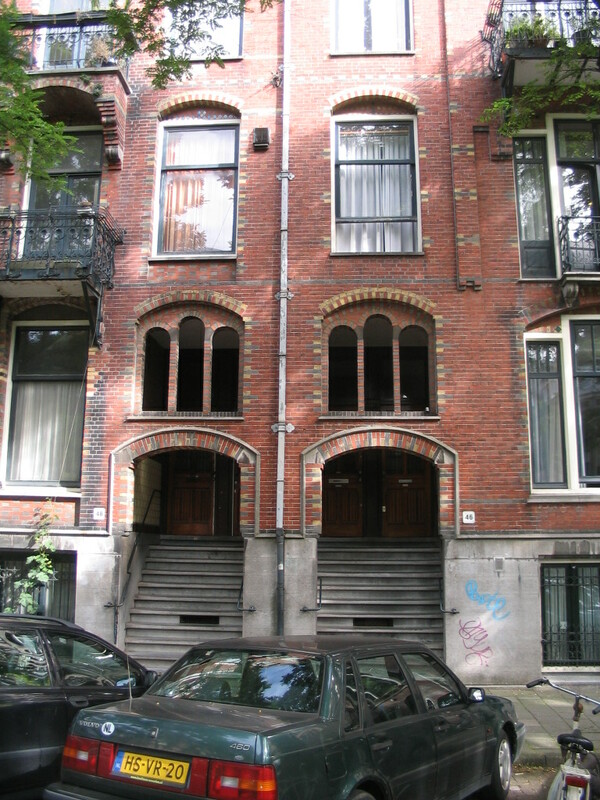 Across Paulus Potterstraat (a great name for a street) there's a neat series of varied open brick entries of which these are two, and I sketched them in my sketchbook as we waited outside to get into the museum. 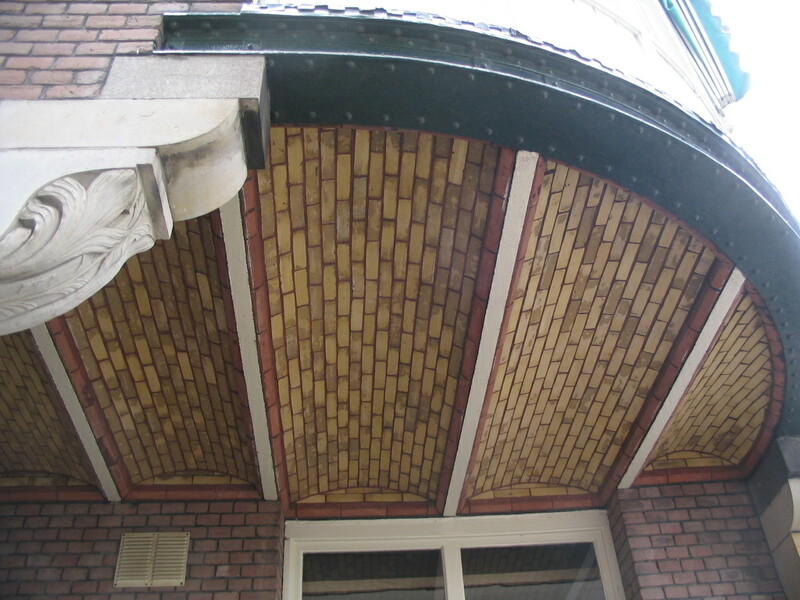 A very pleasing composition of brick, concrete, and wood at the Hotel Museumzicht on Jan Luijkenstraat. 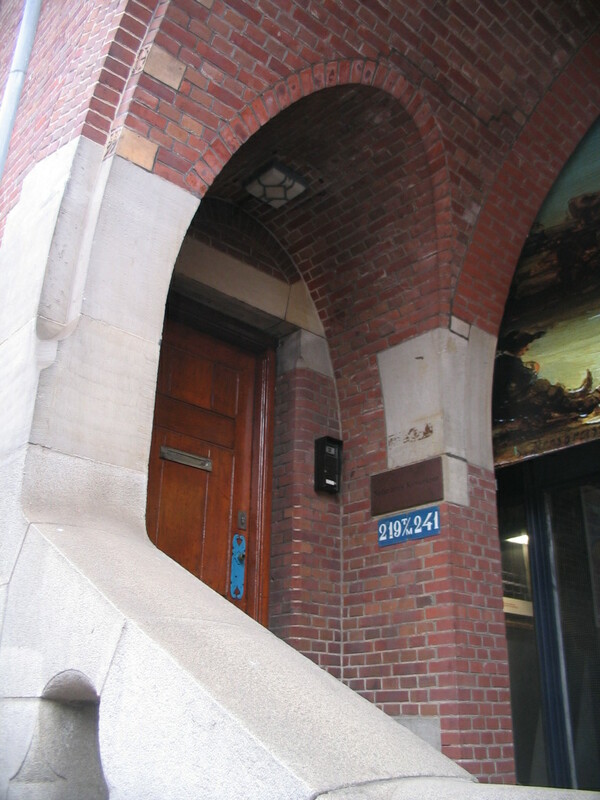 A few doors down, a gracefully integrated structure of metal and masonry. 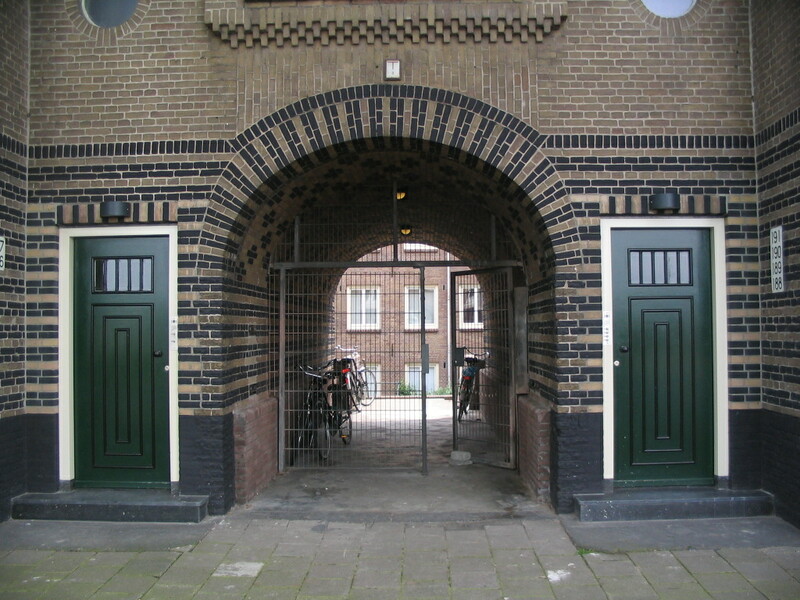 To my surprise and delight, we then passed by this lovely array of Catalan vaults at the corner of Jan Luijkenstraat and Stadhouderskade. 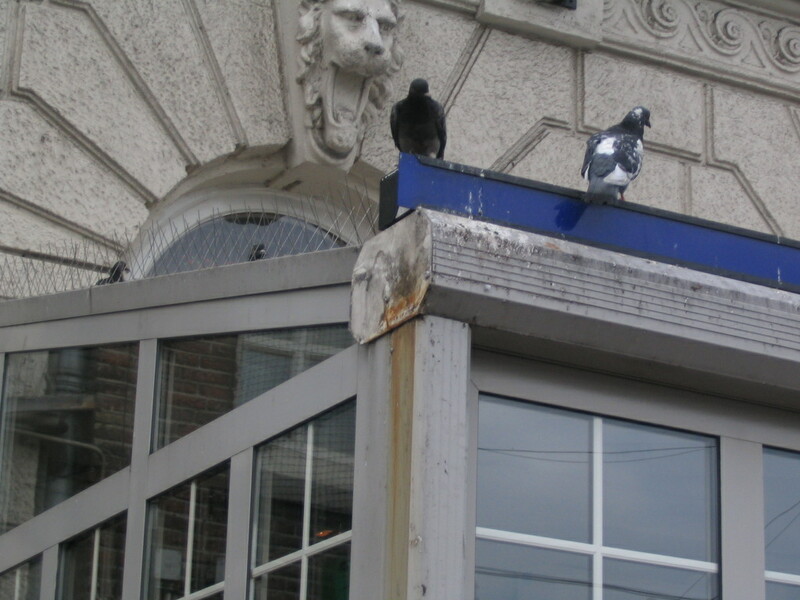 A selection of bedraggled pidges. 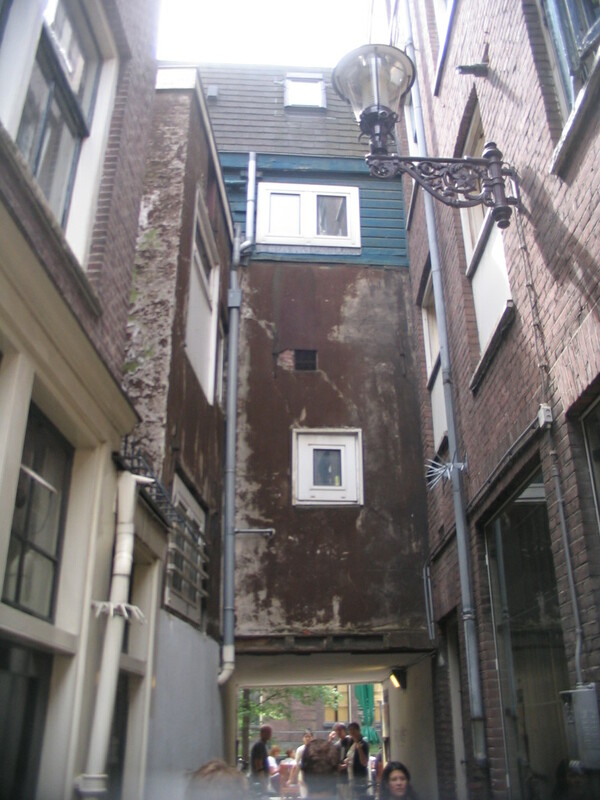 A pretty cool (though dilapidated) multistory building-bridge at, I think, one end of the very narrow alley Gebed Zonder End. 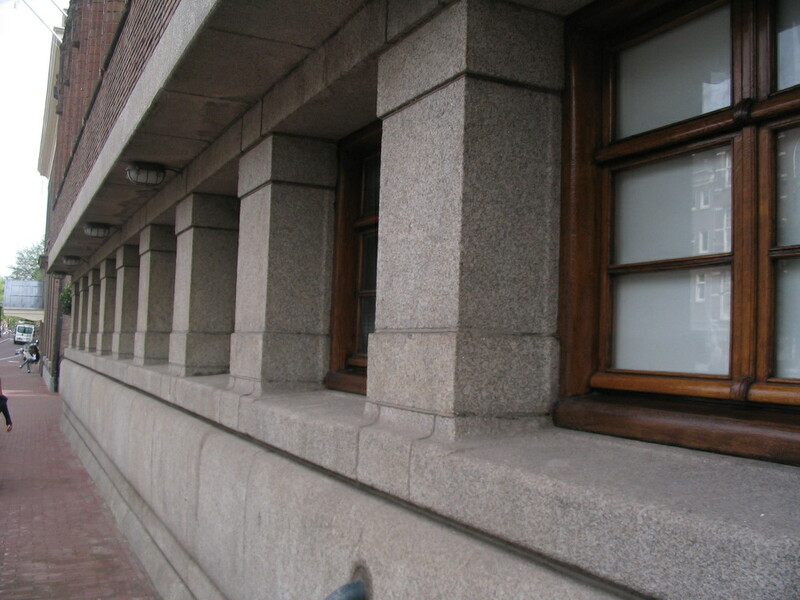 A solidly set series of windows on the east side of the Oudezijds Voorburgwal, south of Prinsenhofssteeg. 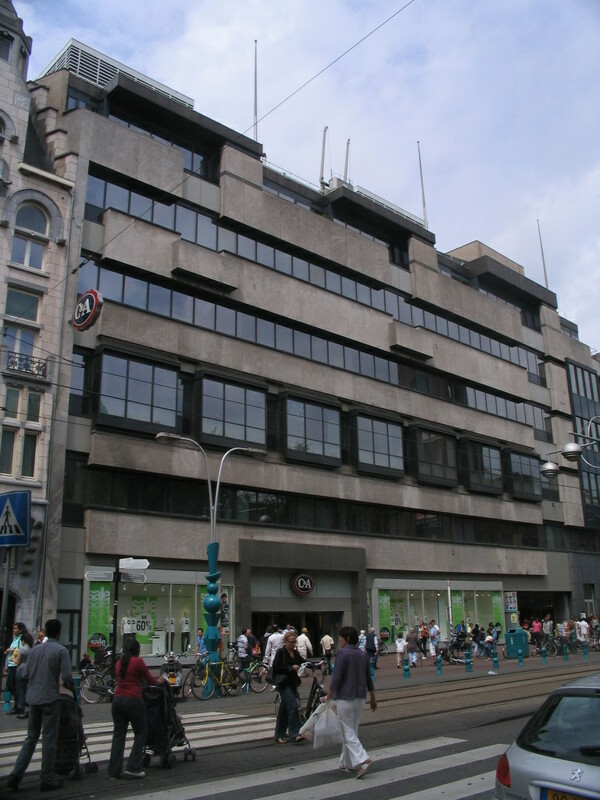 On the west side of the Damrak, just south of the Beurspassage: an odd mixture of heavy and light tectonics. 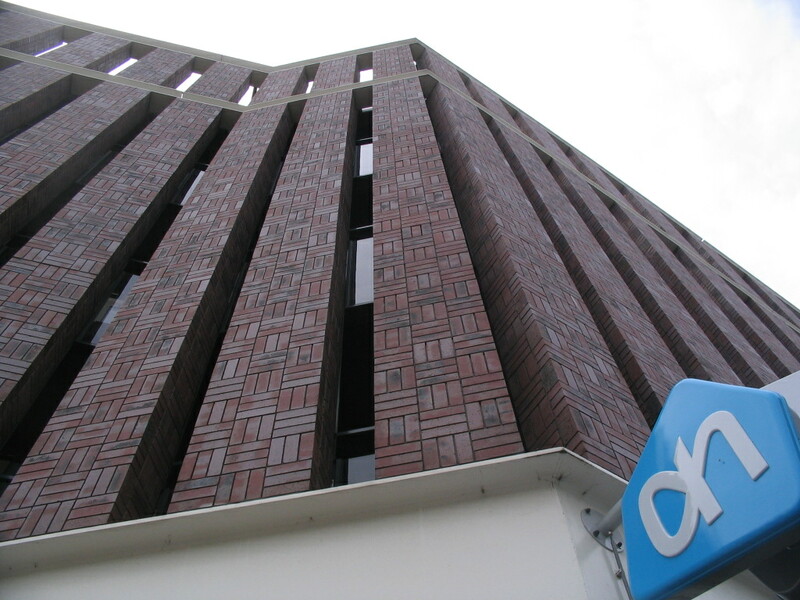 You can tell it's the Damrak because of the teal totems. 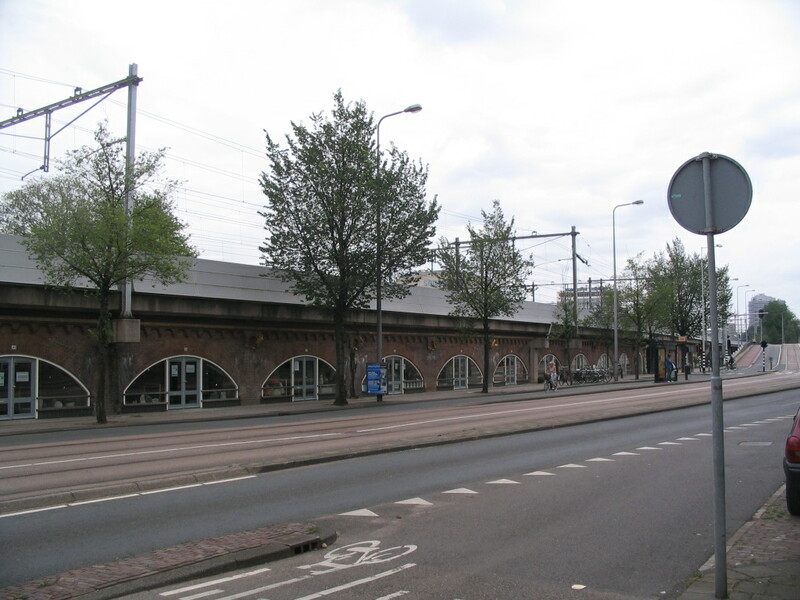 Back at the Beurs, a complex intersection of barrel vaults at the north edge of its main entrance. 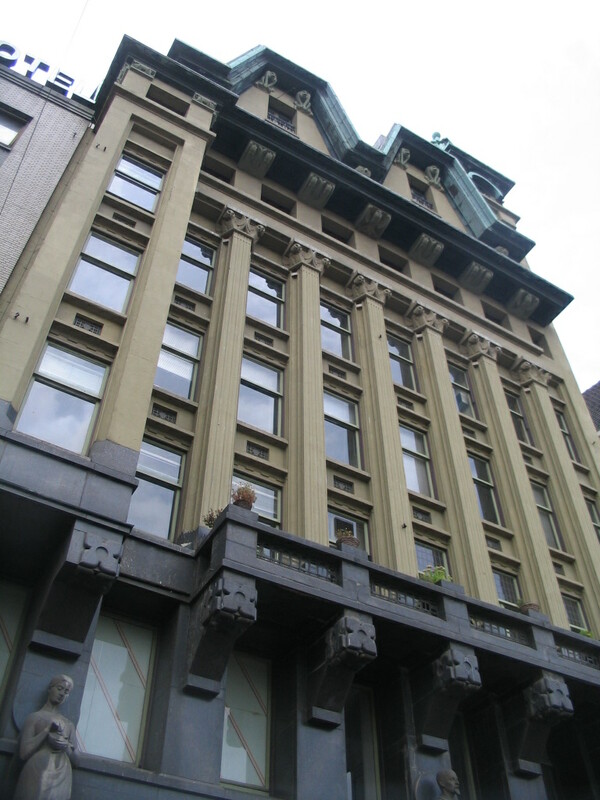 Again on the west side of the Damrak, just northwest of the Beurs: classical columns kidnapped and shoved into an Amsterdam School composition, with endearingly weird results. 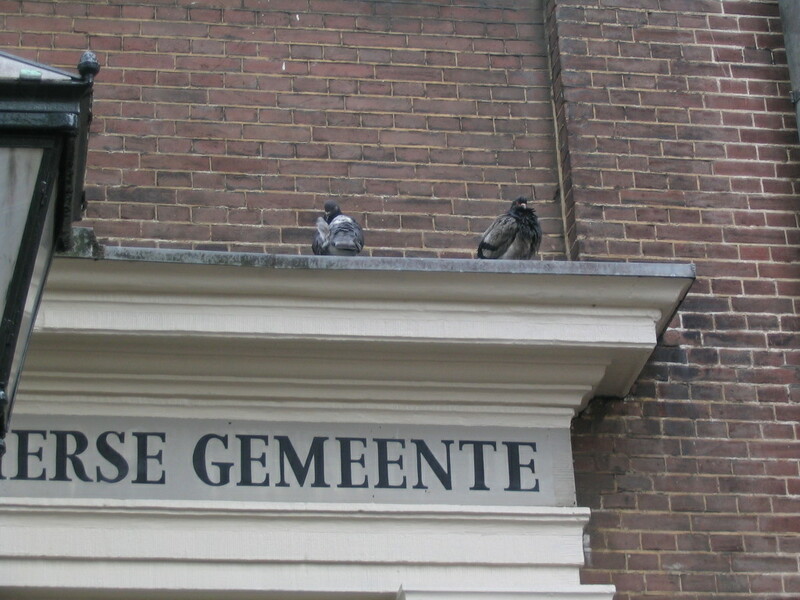 We headed west along Haarlemmer Houttuinen. 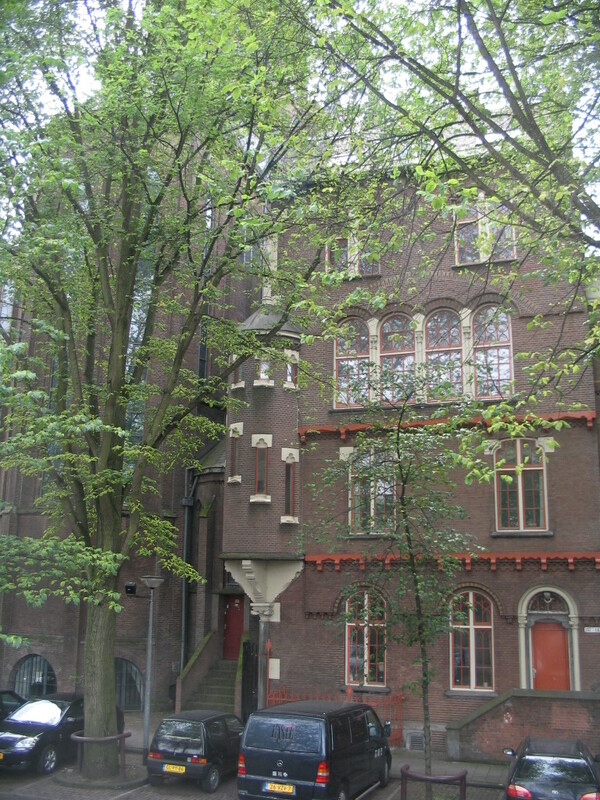 Here's a pretty neat building with a corner oriel that looks like it contains spiral stairs, right next to the Posthornkerk just visible at left. 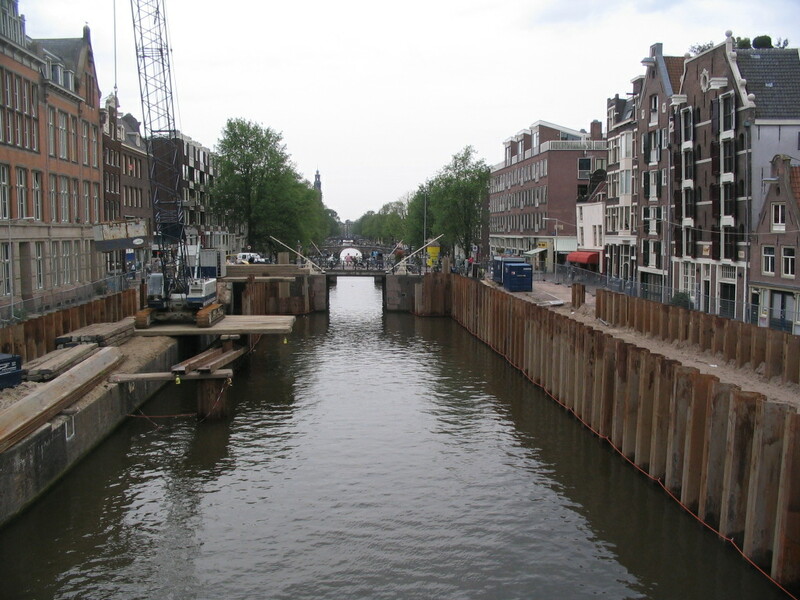 To the south, the banks of the Korte Prinsengracht (Short Prinsengracht) were being renovated. 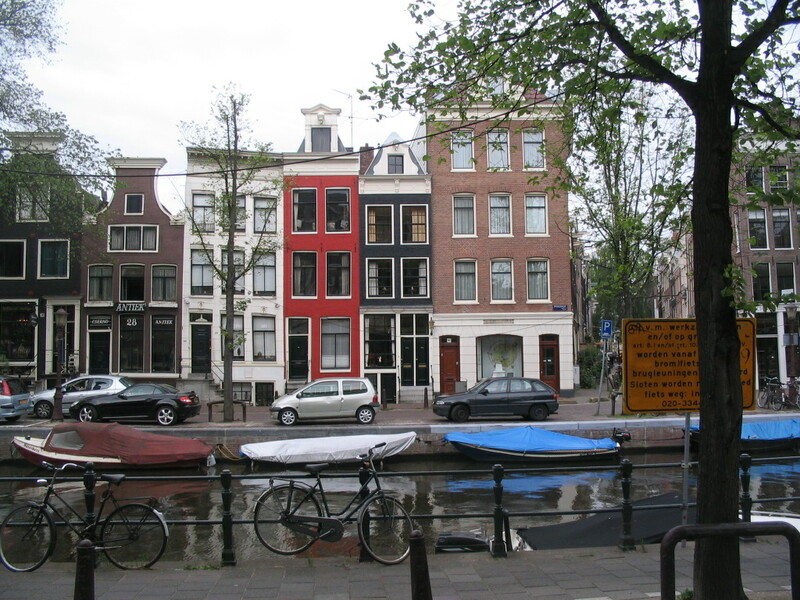 Sprinkles of blue along Haarlemmer Houttuinen just past the Korte Prinsengracht. 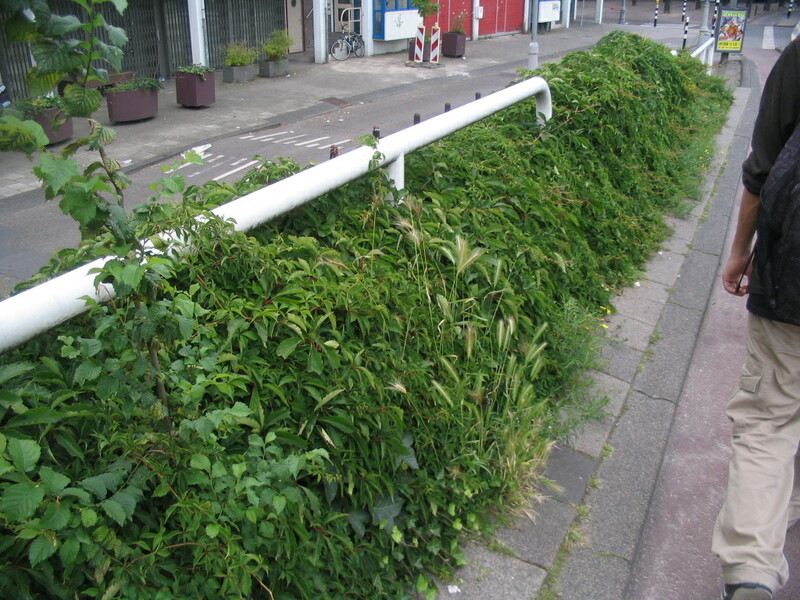 Nature appears to have won the battle here. Now this is a fascinating bit of infill that is unique among the places I've been, as far as I can remember: the space underneath the railroad enclosed and turned into shops. 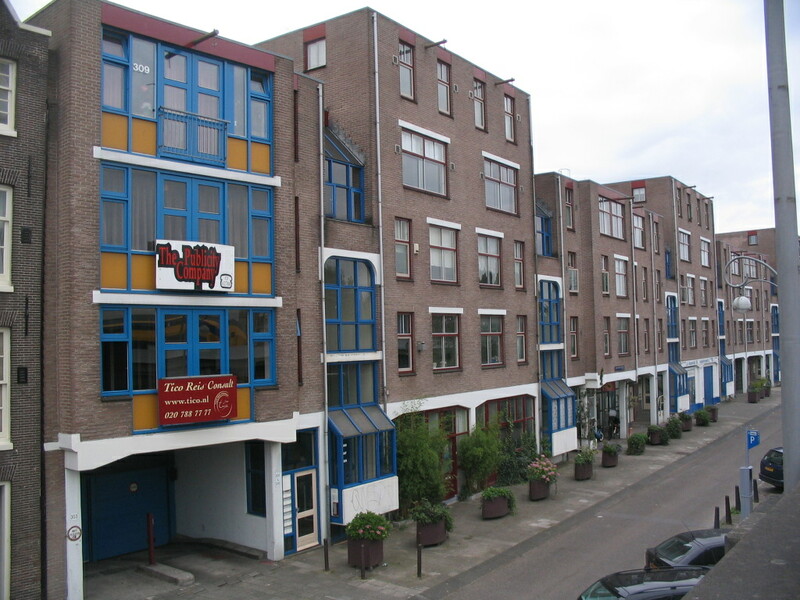 It appears to be aptly named Tussen de Bogen (Between the Arches). A really cool idea — I often think of how much potential there is for the unused space underneath elevated highways and the like. I just wonder how well insulated the interiors here are from the vibrations of the trains! 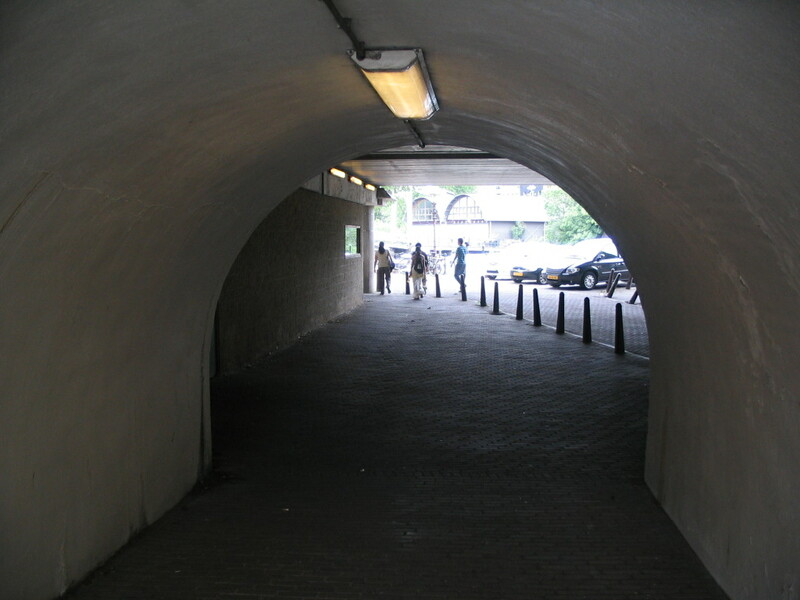 We crossed northward under the rail tracks at Nieuwe Teetuinen through this cool tunnel. 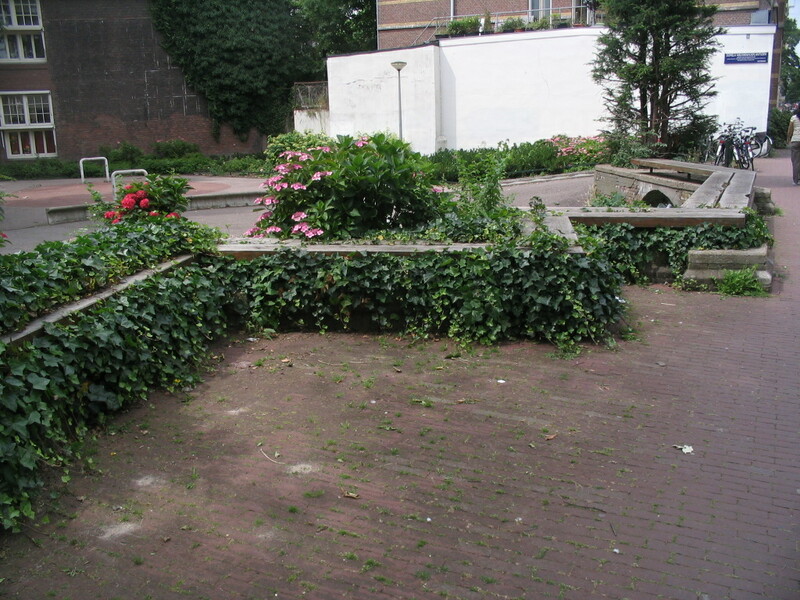 A crazybench by Spaarndammerstraat, at the Domela Nieuwenhuisplantsoen (plantsoen means plantation). 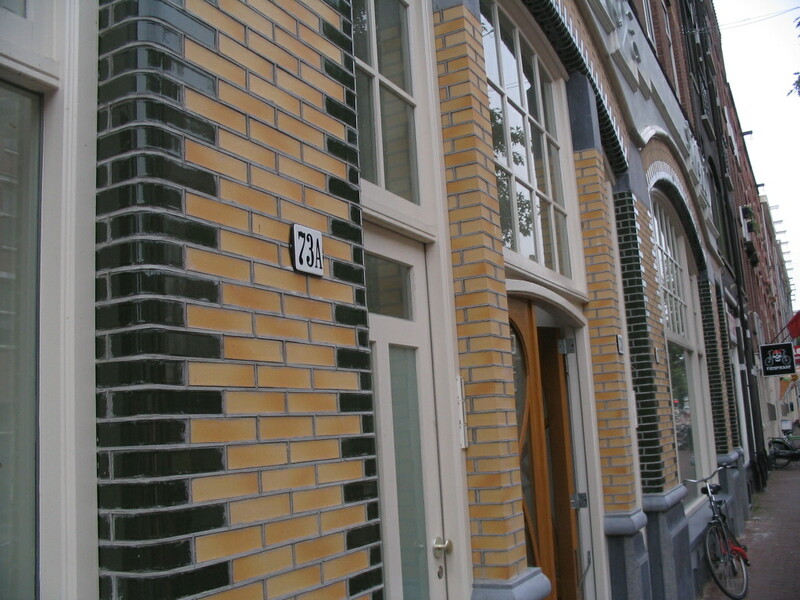 Also on Spaarndammerstraat, brickwork with a nice contrast between matte and glossy. 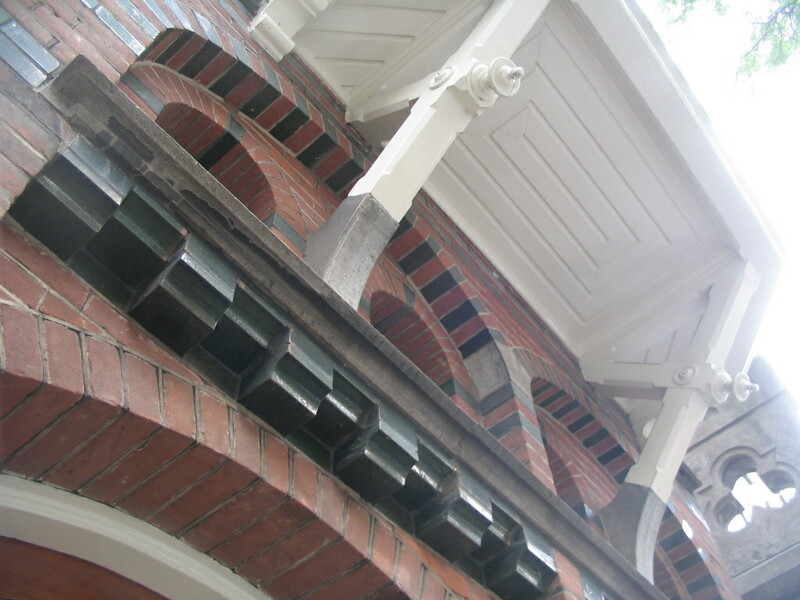 Declarative brickwork on the Albert Heijn supermarket at Spaarndammerstraat and Tasmanstraat. 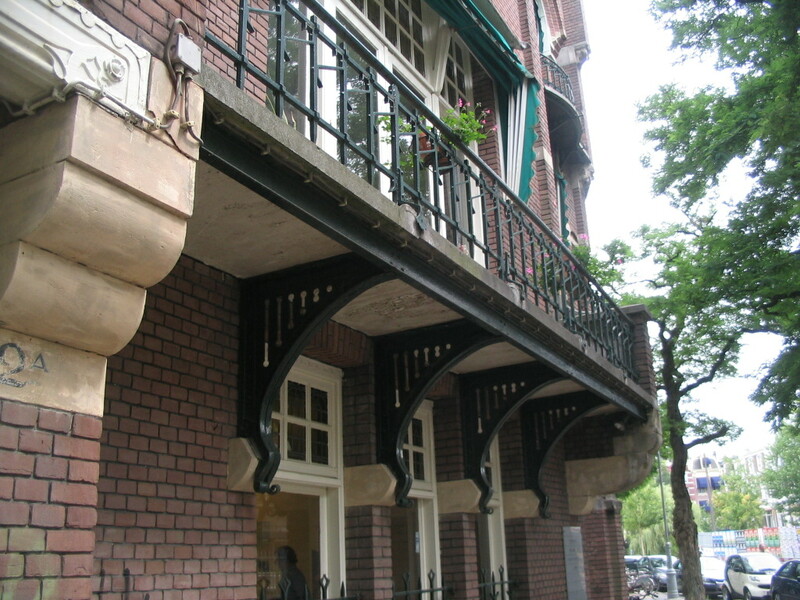 Some hypnotizing details at an apartment block along Spaarndammerdijk.